OPERATED BY: Kaptan Demir Celik Endustrisi ve Ticaret A.S. LOCATION: 40° 57' 28" N, 27° 55' 60" E. Martas port is 100km . West of Istanbul on the Northern shores of the sea of Marmara. MAIN ACTIVITY: The port handles silver sand, bulk wheat, bulk SFS, steel products, billets, bagged cargoes, liquid vegoil, general cargo and project general cargo. ANCHORAGE AREA: is 0.5 mile SW of the port. PILOTAGE: is compulsory for berthing and unberthing provided by the Martas Pilot.VHF channels 12, 16. 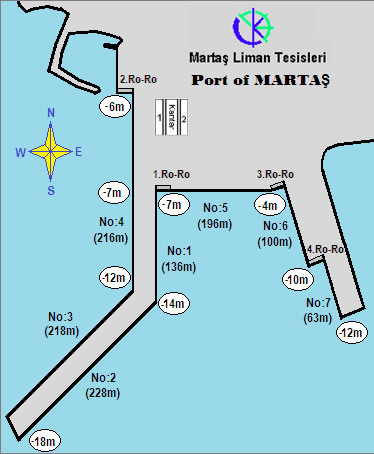 TOWAGE: and/or mooring boat compulsory arranged by pilot and provided by the Martas. MAX.SIZE: 45.000dwt., LOA 250m., draft 13m. and beam 25m. BERTHING: There are no berthing restrictions. CARGO HANDLING RATES: Average discharge for bulk cargoes in a 24 hour working period is 3.500 tons. Wheat in bulk 500tons, Steel product 5.000tons, Coal 1.000-2.500tons, liquid vegoil 1000-1500tons. STORAGES: Open 8.500sq.m. Covered 1.150 sq.m. FRESH WATER: available at all berths. AIRPORT: At Istanbul distance apprx. 50 km from the port. GARBAGE REMOVAL: service is available by truck. DEVELOPMENTS: A new warehouse is under contruction, capacity 15.000 tons, 4.000 sq.m.